Any of you who have read my posts know I am no fan of Sod. In fact, I believe the trend will be that more will have not than those who will have, but if you have, you need to know how to properly care for it. There are two main kinds of Sod in Central Texas, and those are St. Augustine and Bermuda. Zoysia, though seldom used by builders due to cost is by far superior, so we will discuss that later. So lets start with Augustine, my least favorite for so many reasons, but lets name a few…Not Native, uses too much water (in fact up to 60% of American’s drinking water goes to sod! ), too many chemicals used to keep it green, chemicals are killing the planet, people mow it too short which leads to more water use, more chemicals to Green, more mowing…..AHHHH!! Ok, lets re-start. Here is the best schedule and maintenance plan for Augustine. Next, you never mow more than 1/3 of your lawn at one time. (this is true for all sods) In other words, you do not let your lawn get real tall, then scalp it!! You allow it to get to about 6″, then you cut it to 4″. No shorter! 4″ is the shortest it should be unless it is a Spring cutting which you can do shorter to remove Winter damage. During the Summer be sure to mow with a Mulching lawn mower to add the valuable nutrients from your cuttings back into your lawn. Green clippings add nitrogen to the soil and green up your grass as a bonus! Of course you compost in the Spring, but this is Summer we are talking about, so for Summer time fertilization, I recommend Liquid Seaweed, or ” Medina Hasta Grow for Lawns” , both great products and easy to use. All you do is use a hose attached sprayer and fill up the container with seaweed, or attach the Medina product right to your hose and vioala, your good to go! Do not use chemicals, you will lose most of it in rain bursts and they burn your lawn in the heat. Not to mention the unimaginable damage they do to our planet…Here is some excellent information on my liquid seaweed is an excellent alternative to chemical fertilizers. Click Here! Finally, and frankly the most responsible part, take the Summer time to remove some of your water hogging St Augustine to prepare new water wise beds for Fall. Your planet will thank you for it. Here is my facebook page where I list my favorite water wise plants and trees…click here! Bermuda is a little different, while not as fickle and temperamental as St. Augustine, it still has some specific requirements for success. Ideally,this turf should not be irrigated on a regular schedule, but on one that is determined by need. If you walk on Bermuda and you leave foot prints, or it has a blue grey color to it, it needs water. 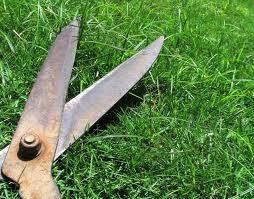 Common bermuda grasses are cut at 1.0 to 2.5 inches May thru August and 1.5 to 3.0 inches in September. Unlike St. Augustine, keeping your Bermuda short is a good thing. The conditions that affect plant growth fluctuate from week to week, so the ideal time to mow is at a point when no more than a third of the leaf area is removed at any one mowing. (same as Augustine) So if you are mowing at a two-inch height, cut the grass when it reaches a three-inch height. It is preferable not to bag grass clippings since collecting clippings removes valuable nutrients from the lawn, grass clippings take up valuable space in the landfill and bagging clippings takes more time than mowing with a mulching mower. Brown patch is most prevalent on Bermuda grass which has been heavily fertilized when night temperatures are above 68 degrees and day temperatures are above 80 degrees. Dead patches of grass may start small but can grow and join together to make patches more than 3 feet apart. Sometimes, there will be a ring of brown, dead grass surrounding a patch of green grass. To control brown patch, fertilize bermuda grass moderately in summer and if you irrigate, do it in the very early morning. There are lawn fungicides available to control brown patch. Read the label carefully and use the rate and timing that is indicated. Do not over apply! Organic control can be done with liquid Garlic if you catch it early enough. Finally, Zoysia care for any of you who may have it. It is the best performer if you can afford it and the maintenance is very similar to Bermuda. As is the watering schedule. Due to the aggressive nature of growth on Bermuda and Zoysia during the Summer months, it really isn’t necessary to fertilize at all. Fertilization can be done in the Spring only by composting. Excessive chemical fertilization of these 2 sods creates a thatch problem from excess growth. It is recommended that you de-thatch and aerate these lawns every spring to avoid a thatch problem. I recommend de-thatching Augustine (which can be done with an attachable lawn mower tool, or with a soft rake) at least every other year. Again….just makes me want to take it out and put in some more beds. Far less water once established, Native, and so much less maintenance. If you must have sod, consider some of the alternatives like Buffalo and recently developed seed and sod that is far more user and planet friendly. You can also make a greater impact by reducing your lawn area into an intentional smaller lawn space that is a showcase, making it easier to maintain and water responsibly.